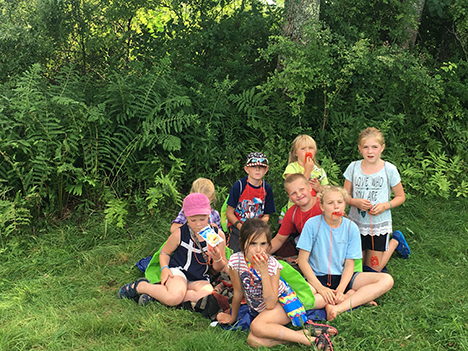 Nineteen local 4H members, ages 5-13, participated in a Wilderness Survival Weekend hosted by Victory Workers 4H Club on July 28th and 29th in Pittsfield. 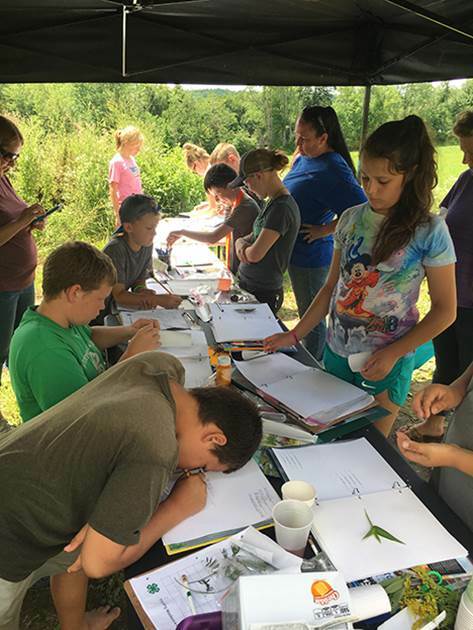 The members and their families learned how to build a shelter, read maps and a compass, identify plants, as well as many other critical outdoor skills through various hands on activities. 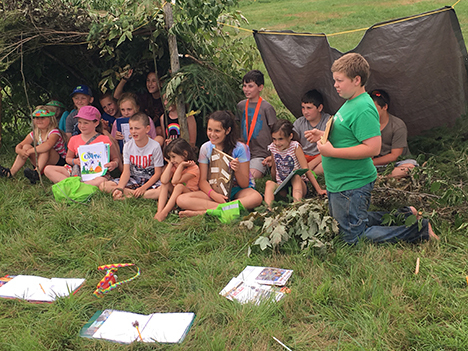 After making their items for the weekend, it was time to learn some skills needed to survive in the wilderness. When asked about her favorite part of the weekend, Addison (age 7) said “I liked it all but if I had to choose, I liked learning how to read a compass because I like to know where I’m going.” After learning how to read a variety of different types of maps and learning to use a compass, all of the kids used their new skills to complete a scavenger hunt where they found great hiking supplies along the way; a small back pack, a wildlife tracking card, snacks (including jerky), a drink, tissues and hand sanitizer. Knot tying was another skill-based workshop where five different types of knots (thief knot, slip knot, half hitch knot, bowline knot, square/reef knot, clinch knot) were learned, practiced, mastered, and then displayed for a fair exhibit. Taylor (age 10 ) was definitely thankful for the shelter building workshop. She said, “Building the shelter taught me the experience. If I get lost while hiking with my family, I know how to build a shelter quickly if there’s a storm.” The kids started collecting some ferns and dragging tree branches for their shelter throughout the day, but the weather didn’t cooperate to get it built in time to sleep in it for the night. The rain didn’t dampen their spirits though; the kids were still excited to learn the basics the following morning. They learned about three basic structures (lean-to, tarp shelter, and debris shelter) and worked together and used some of those knot tying skills to build two of them. Thankfully the rain broke just long enough Saturday night for the kids to experiment with different ways to start a fire without matches because Charley (age 13) said that he enjoyed that part of the weekend the most. The sun was beautiful Sunday morning and the kids and adults enjoyed some morning yoga in the dew covered field before breakfast—sun, tree, flying bird and falling rain were among some of the nature-themed poses learned. After breakfast both age groups ventured together to the stream with their nets and field guide books for some exploration. 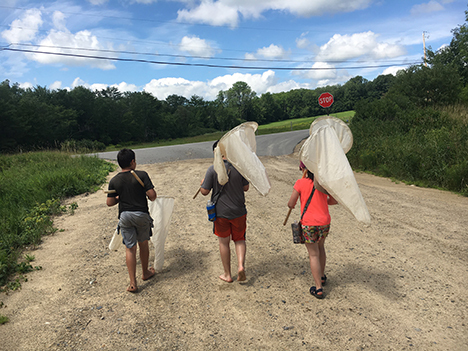 The kids learned about entomology (the study of bugs) and caught and observed water striders, dragonflies and others. During their exploration, they also spotted over 10 different types of wild mushrooms along the river bank and in the woods. Some of the kids are looking forward to identifying them through the photos they took! Thanks to the Merrimack County 4H Foundation for the grant which allowed members to each make an extensive First Aid Kit which will also be exhibited in the Hopkinton State Fair.